Casa Vista Alegre sits majestically on 'Gringo Hill' overlooking the quaint town plaza of Sayulita. When this Non-Smoking house was first renovated in 2003, deliberate care was taken to maintain the history, authenticity and special feeling of the 'old style'; this is not a 'modern' house, but a very comfortable house, nonetheless. Known to most as 'the house with many doors,' Casa Vista Alegre is a home of brick, large timbers, and eight sets of stunning wooden/iron double doors. Sitting on the first rise above the quaint town of Sayulita, there is one short hill to navigate up from the town plaza, but the views make it totally worth the short "climb"! HAPPY TO ANNOUNCE: As of April 1st, 2019, we have partnered with "Sayulita, AtYourService" to oversee your guest experience and provide the best possible vacation! Personalized communication (with concierge service) prior to and during your stay, will make this a memory of a lifetime! I welcome the SAYS TEAM to Casa Vista Alegre! The main floor of the home consists of Suite Principal, Suite el Medio, a full kitchen, dining area and airy living room. The bedrooms ARE air conditioned with individual units to allow for perfect sleeping conditions, even during the warmer summer months. The kitchen and living areas are not air conditioned, but cooled by the fabulous ocean breezes thru the secure locking iron screened doors. Suite Principal has a private entrance, private bath w/shower, kitchenette, SMART TV for Netflix, air conditioning and luxurious king-size memory foam mattress bed. (see photo) Enjoy the view of the crashing surf as you bathe in the open air shower! Suite el Medio has a queen-size bed and individually controlled a/c, with an adjoining private bath complete with HUGE tub and dual showerheads. The bedroom offers a private entrance from the veranda, although it can also be accessed from the main living area. The 500 square foot living room, with full kitchen and SMART TV with NETFLIX capabilities, provides a spacious and relaxing gathering area. (see photo of this room). Suite Abajo is accessed right inside the property gate, just a few steps up from a quiet residential street. An air conditioned suite with private open air bath, kitchenette, tiled floors, beds for four plus a queen size sofa sleeper, gives this room both quantity AND quality! Recently upgraded with beautiful tile work in both the bath and kitchenette. Casa Vista Alegre is perfect for large groups who want to be together, but also want to maintain some privacy. Although just 3 blocks from the beach, two private swimming pools provide the utmost enjoyment on the hot and sunny Mexican days as an alternative to the ocean. Complete with a large architecturally designed infinity swimming pool with expansive pool deck this amazing tiled pool has built-in lounge chairs and perimeter seating. If you prefer a smaller pool with a bit of shade, there is a beautiful 'plunge' pool a level up, right off the main floor kitchen and living room. At Casa Vista Alegre the possibilities for family, fun, adventure, romance, and relaxation are endless! PLEASE DO KEEP IN MIND, HOWEVER...this is a RURAL area of Mexico. PLEASE always lock the casa when not there, and at night. PLEASE use the safe for valuables. PLEASE do not leave enticing valuables in plain site or outside, making yourselves and the casa a target for petty theft. Put computers, phones, cameras and of course cash...in a safe place and out of view. At Casa Vista Alegre, we do our best to keep everything up and running, but sometimes we have to go with the Mexican flow and be patience. Please know that we will do everything we can to keep your services running smoothly, but sometimes those things are out of our control. That's when you head to the beach...and just grab a margarita and RELAX! If the small possibility of these things happening is upsetting or unnerving, then we are probably not the casa or town for you. Keywords: Amazing ocean views and breezes just a block from the village plaza! The unique benefits of this home in Sayulita include an expansive view of the Pacific Ocean, amazing peace and tranquility, being able to watch the whales at play from the privacy of your own veranda, hearing the joyful sounds of the village as it comes alive in the evenings, the pure pleasure of swimming and relaxing in one of two pools, and quality time with your family and friends; the list is endless. ALL bedrooms are air conditioned. The Living Room is not. Beach towels provided. Bottled water provided. One full kitchen on the main floor of the house. Bottled water provided. iHome docking station speaker for ipods and iphones. We welcome for books to be added to the shelf for future guests to enjoy. This casa is on several levels, with stairs and uneven surfaces. It is not handicap accessible. (2) TWO private pools; a large infinity pool with built in seating and loungers and a smaller plunge pool w/ seating. Neither are heated. Light housekeeping services during stay. Beds linens changed every 4th day of stay. Pool cleaned every 2nd or 3rd day as needed. Comfortable lounge chairs by pool. Satelitte TV in Suite Principal and living room, Kitchen and Kitchenette, Microwaves, Refrigerators, Beach Towels, Large Infinity Swimming Pool, Small 10X12 Relaxing Pool, Air Conditioning in all bedrooms. Amazing property in the heart of Sayulita! The staff was great, very helpful and responsive. The house is lovely, a little rustic but fit our family of six nicely. Thank you Ben for your kind words. We sincerely hope you and your family enjoyed your visit and we'd welcome you back any time! I appreciate your kind care of our casa and your friendliness to our staff. Thanks for choosing to stay at Casa Vista Alegre. Happy 2019! geat location. Nice pools. Excellent house and garden service. A nicely furnished and well equiped property. Lower third bedroom ac did not work which was particularly unfortunate at this time of the year. I am sure this will be rectified. A highly recommended property. Host was very responsive and very helpful. Appreciated the welcome bottle of tequila! A very nice touch. Outstanding experience on your beautifully kept property! We had everything that we needed and were given wonderful hospitality by your staff! And the flowers & wine were a pleasant surprised to begin our stay there. With much gratititude to you LeAnne & Kevin for providing such a beautiful location for both Jennifer & I to enjoy Sayulita. Thank you Jerry for your kind words! So happy you enjoyed your stay. It was our pleasure to have you! 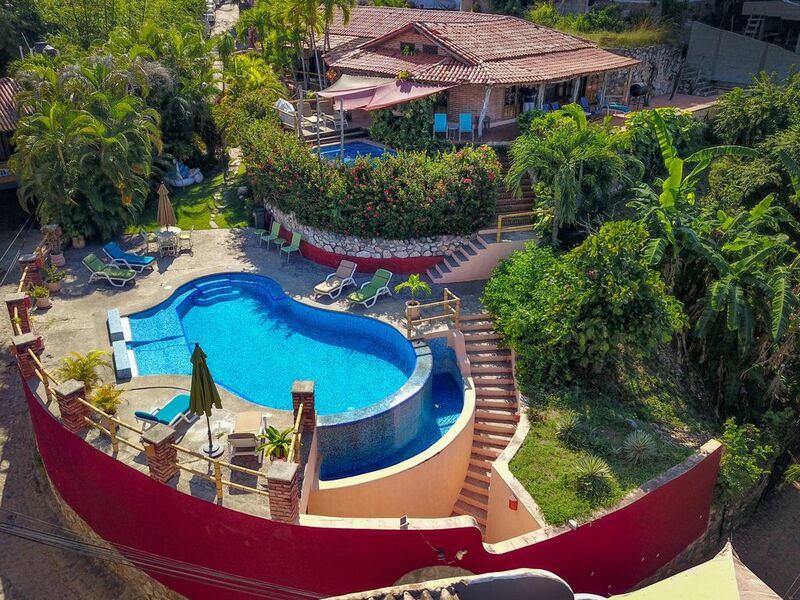 You will not find a better house in Sayulita! We just returned (reluctantly) from our trip to Sayulita and our stay at Casa Alegre. We traveled with two families of four. It was PERFECT for us. LeAnne's description hardly does the house and location justice. The house and amenities are really wonderful. The pools are both amazing, although we consigned the kids to the lower (infinity) pool while we cocktailed and read and soaked at the upper pool. Just down the steps you are immediately in town with all the locals. The absolute best chicken you'll ever eat is less than a block away from your door. The amazing beach is so close we had no problem letting our elementary school age kids head down together without us. Sayulita has a great local feel without being overrun by us gringos. So safe, so beautiful. We will absolutely return to this house next time we come to Sayulita. LeAnne, Thank you so much! You can use me as a reference anytime! The location of and views from the house are excellent. It is only a block or so above the zocalo and two more short blocks from the beach (5 min walk); yet it is high enough to have a great view over town and up the coast and to feel removed from the hustle and bustle of town. The pool next to the house is a smaller pool meant for cooling off on hotter days. The big pool is down one and a half levels and is great for swimming and kid's play. The house is an older, comfortable place with an open kitchen and living area and adjoining terraces that easily accommodated our extended family group for meals and just hanging out. On the main level within the house the only way to the master bedroom is through the second bedroom and the shared bathroom. Each room, however, has an outside door to a covered terrace so the solution is to use the terrace as the hall. The third bedroom is a separate unit below and behind the main house with a partially separated kitchenette and eating/living area and bath. It is not fancy, but with a double bed, bunk beds and a couch, it can sleep a crowd. There are lots of stone steps down to the big pool and further down to the street requiring some vigilance with kids. Casa Vista Alegre was a great place for our extended family of grandma and grandpa, uncle, mom and dad and three grandkids. It was easy for everyone to come and go to town and the beach and to hang out at the pool or around the house. Rates are subject to change. A reservation is not confirmed until the deposit it received. Tipping the staff for a job well done is usual, customary and very much appreciated.